The job of the envelope beside delivering the content inside is simple - to be opened. Envelopes are the first thing you see, so you need to make a good first impression and stand out from the crowd. We will share tips below on how to maximise open and response rates by picking the right envelope. While you may think direct mail marketing is on its way out due to modern methods such as email marketing and social media, the opposite is true. Direct mail is as popular as ever and with regulations such as GDPR, it is sure to be an effective marketing tool for your business. There have been numerous studies that show people respond much better to direct mail over digital methods and are more likely to favour your brand. The first thing you are going to need to do is to choose which size envelope you need to fit in the contents of your campaign. Generally, most mail through the letterbox is sent in either C4, C5 or DL. This is because they all fit A4 sized letters. A4 will fit into C4 envelopes unfolded whereas A4 will fit into C5 envelopes folded once and A4 will fit into DL envelopes folded three times. However, your content may include oddly sized content or bulky contents in which case you may need a more suitable size. Our envelope size guide can help you pick the right envelope for the job. Regular mail received through the letterbox is generally sent in self-seal envelopes and of lower quality (80 - 90gsm). This is fine but if you really want to be above the rest and leave a lasting impression, we would recommend choosing a brightly coloured envelope. 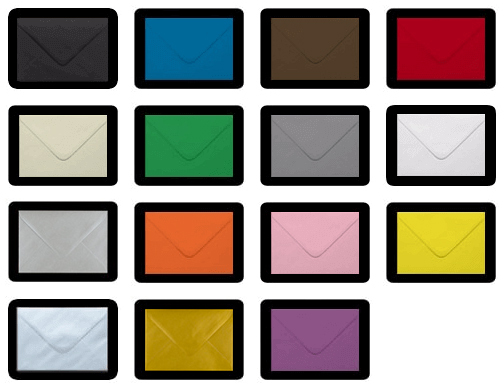 Research shows that using coloured envelopes, increases open rates significantly compared to standard white envelopes. We would also recommend choosing a higher quality (100gsm - 120gsm) envelope with a peel and seal flap. These add a premium feel and can help to improve the perception of your brand. Another method that helps to increase open rates is printing your branding onto the envelopes. You can not only print your business branding onto the envelope, but you can also add personalised offers or incentives to open the envelope. For example 'FREE gift enclosed' or 'Exclusive offer just for you' are likely to entice the receiver to open your mail. Custom printed envelopes are slightly more expensive but can greatly benefit your business when sending direct mail. Although this may be time-consuming and not feasible for large direct mail marketing campaigns, handwriting the address onto the envelope can be a great way to make sure your campaign is opened as it gives a more personal feel. However if not possible due to the size of your campaign you can simply print the addresses onto your envelopes in a handwritten font. We offer an envelope printing service in which we can do this for you in any choice of font along with your business branding. We stock a huge selection of envelopes at wholesale prices in all sizes, colours and styles for your direct mail needs. From traditional envelopes to coloured, metallic, pearlescent and gusset envelopes with expanding sides to enclose bulky contents. 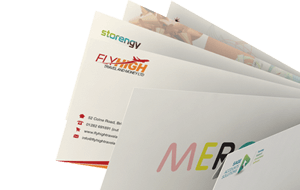 We also offer a low-cost envelope printing and packaging printing service to personalise with your business branding.